No need to fight over the blanket anymore. Whether curling up on the couch to watch TV or keeping warm in bed, your kids will love having a comfy Cozy Faux of their own. 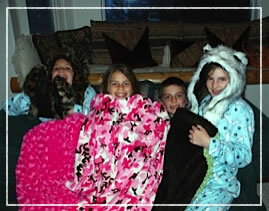 Our Cozy Kids collection comes in a variety of fun colors and patterns. Select from either rosebud mink/rosebud mink or rosebud mink/crushed velvet fabrics. Blankets are 54" x 60".